Cardiac Resynchronisation Therapy (CRT) is one of the few effective treatments for patients suffering dyssynchronous heart failure. Magnetic resonance (MR) imaging has provided an excellent modality for characterising anatomy, scar and function of CRT patients, to predict patient response and guide therapy. A growing number of patients now require a CRT system but already have a right sided heart pacemaker, defibrillator or a failed conventional CRT implant. Despite improvements in MR safe devices many implants may not be MR safe or cause significant image artefacts around the heart limiting the utility of the images. This project will aim to exploit recent advances in dual energy CT scanners that provide high image contrast and with low radiation dose cardiac imaging at exceptional spatial and improved temporal resolution. The objective of this PhD will be the design, development and testing of an image processing and visualisation platform for extracting key indices of cardiac function and anatomy from cardiac CT imaging to predict the outcome of CRT and guide therapies. Heart failure (HF) is a lethal syndrome representing a common ‘final pathway’ for sufferers of a multitude of cardiac diseases. One in five people will suffer from HF during their life time and once diagnosed ~40% of patients die within one year. Cardiac resynchronisation therapy (CRT), where pacing the left and right ventricles re-coordinates cardiac electrical activation to produce a synchronous and efficient contraction, has emerged as one of the few effective and safe treatments for HF. However, at present 30% of patients fail to respond clinically through improved quality of life, exercise capacity and New York Heart Association (NYHA) functional classification of HF and up to 40% show no beneficial reverse remodelling, with a less than 15% decrease in end systolic volume. Determining where to place the CRT lead requires answering three questions: Firstly, where to place the lead. Second: what is the anatomical access to the heart. 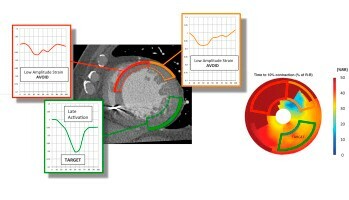 Finally: can delayed enhancement imaging identify infarcted regions in heart from CT images. The final image processing platform will identify the last viable contracting, non-scared region of the myocardium that can be accessed by the coronary anatomy as the most likely CRT pacing location. This information will be projected onto the X-Ray overlay during procedures to guide CRT therapy delivery.